Debbie Cowens: The Event now available free in pdf! The Event now available free in pdf! It's a simmering tale of unease, madness and disaster set in Wellington. 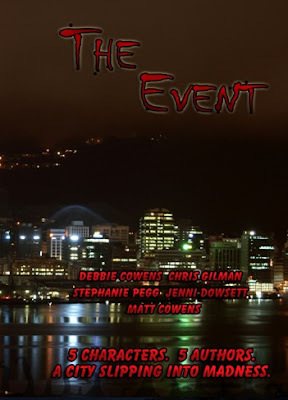 Five authors (myself, my husband Matt, Stephanie, Chris and Jenni) collaborated to describe the events of one terrifying night in Wellington, following five protagonists as they tried to survive and comprehend a night of horrors. Matt has done a fantastic job in layout and we were lucky enough to be allowed to use some stunning photos of Wellington from Jenni, Jeremy Blandford of Wellington Daily Photo, and Jes Fraser. It was an incredibly satisfying experience working with such talented people and the final project, sitting at a little under 40,000 words, is one I am very proud of! I can't wait to for my own copy of the paperback to arrive. The pdf is approximately 1.5mb. The print copy of the book is 187 pages. And a hint - I would consider it the best Christmas present ever to receive the book. Well, that's not so much a hint as a directive, I suppose - but still, you know what I want, what I really, really want! etc.